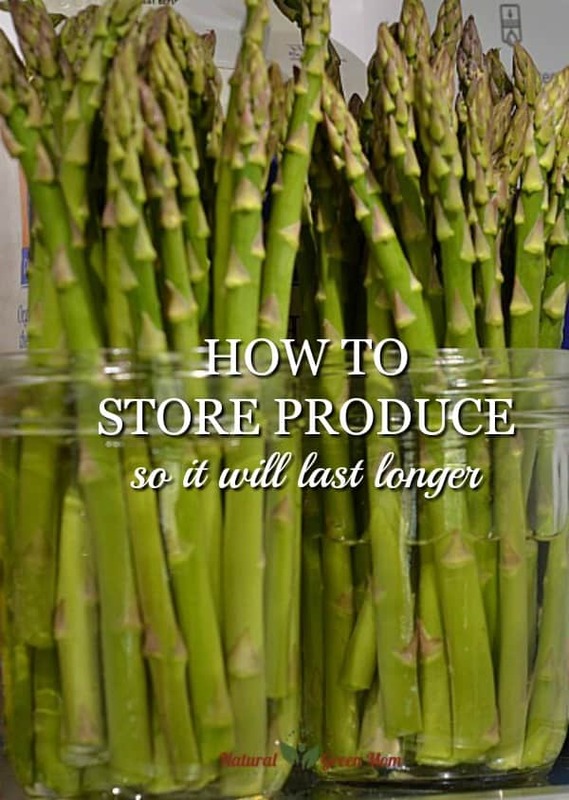 Here’s exactly what you need to know about how to store produce so it will last longer. Produce storage can be confusing. 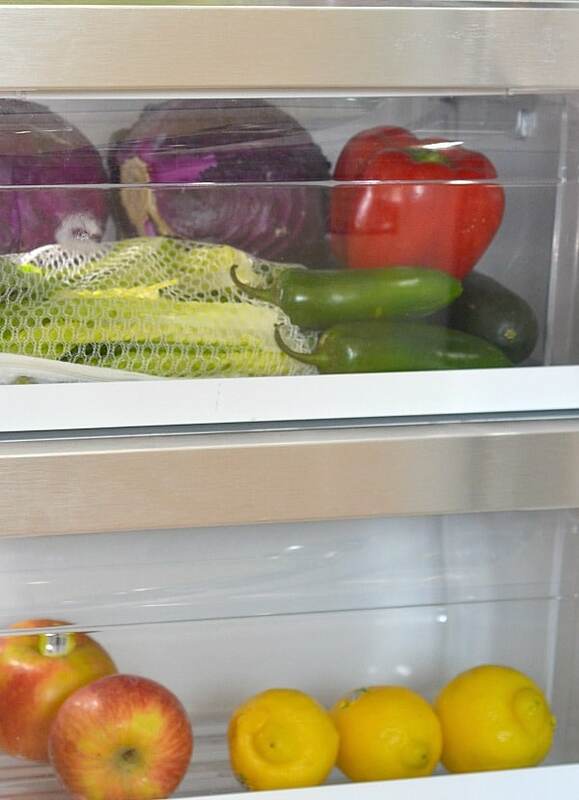 What vegetables do I store in the fridge? What do I leave on the counter? Should my berries be kept in the original container? Do apples need to be refrigerated? Every fruit and vegetable seems to need a different condition: dry, dark, humid, cold…. While it can get cumbersome to learn how to store your fresh produce, it can also save you serious money in the long run. After all, throwing out rotting produce is just like throwing out money. I made a video that you’ll find at the end of the post, but let me give you the short version of how I do it here. In my kitchen I keep two large baskets on a bookshelf. These baskets are large, provide good circulation, keep things cool, and are out of direct sunlight. In one basket I store potatoes (sweet and white) and winter squashes (acorn, butternut, and spaghetti). Stored properly, potatoes can keep for weeks, while squash can keep for months. In the second basket, I store my onions, shallots and garlic. Potatoes and onions, while both requiring dark and cool storage with good ventilation, do not play nicely together. They should be stored separately. On my counter you’ll find bananas and tomatoes. Neither require refrigeration. 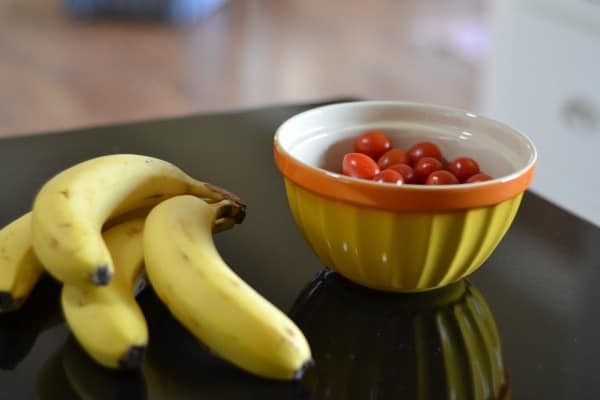 In our house, I’ll wash any cherry or grape tomatoes and set them out in a bowl on the counter. Guess how long they last that way? That’s because every time someone passes by, they’ll grab a handful to eat. It’s AMAZING how having it prepped and easily accessible means my family will just pop them in their mouth! Asparagus can be so expensive! Make sure you are storing it correctly and use it quickly. 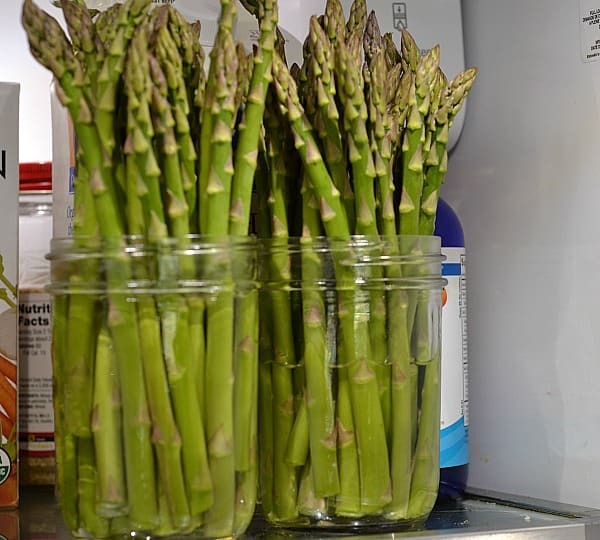 Stand asparagus up in a jar (a wide mouth Ball canning jar is awesome) and add about 2 inches of water before placing in the fridge. Berries also belong in the refrigerator. HOWEVER, if you want them to stay fresh as long as possible, they need a vinegar soak. To a large bowl, add 4 cups water and 1 cup white vinegar. 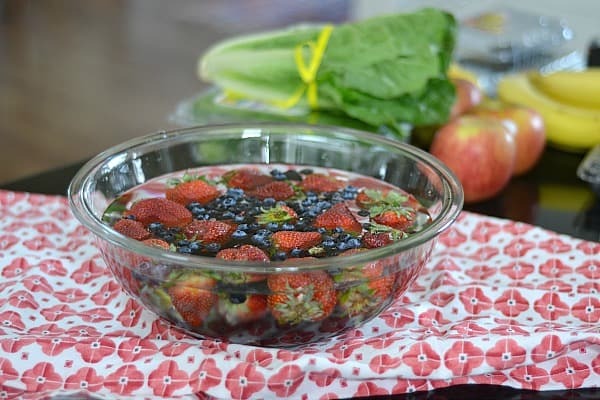 Add berries and allow to soak. Rinse thoroughly to remove any vinegar taste. Next, you need to pat them dry before storing them in a glass container. I remove the pad from the bottom of berry box and add that to the bottom of the glass container. This helps keep the berries dry. Cover with a paper towel and store in the refrigerator. Even after prepping your berries for the fridge, make a plan to eat them quickly as they are highly perishable. Celery, carrots, and radishes could just be put in a high humidity crisper drawer. Make sure to remove them from any plastic first. That said, I’m a huge advocate of taking just 5 to 10 minutes to prep them first. If you will get in the habit of prepping them as soon as you get home from the store, it makes meal and snack prep soooo much easier. 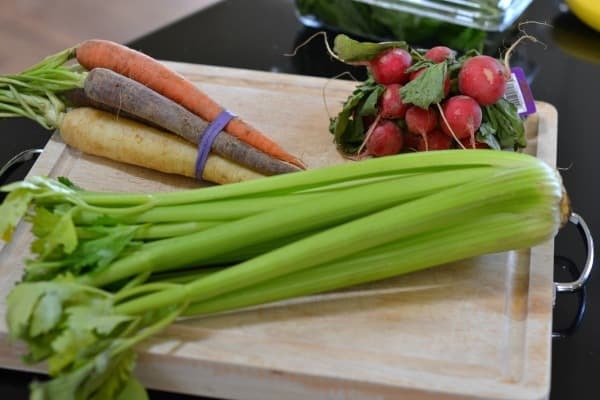 Wash your carrots, celery and radishes first. 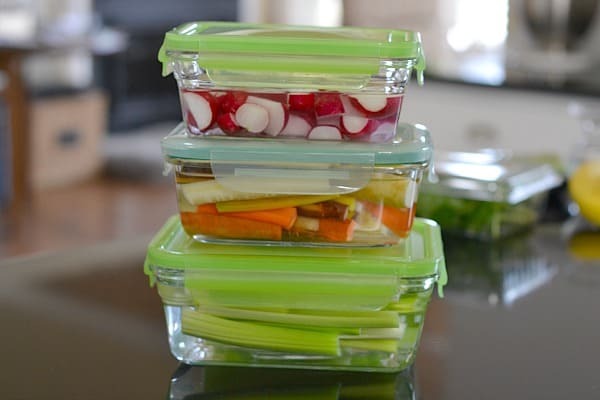 Cut to fit in whatever glass containers you own. Cover with water. Add the lid and refrigerate. The high humidity drawer is for your lettuce, cucumbers, summer squashes, cabbages and peppers. The low humidity drawer is for apples, lemons, limes, and other fruits. I hope this helps but for further explanation, here’s a video on How to Store Fresh Produce that shows my exact methods. Knowing how to store your fruits and vegetables so they will last longer saves you money on all of your produce purchases. Prepping them ahead helps make healthy eating choices easy. Previous Post: « Score an Insulated Lunch Bag at 79% Off! Thank you for compiling this helpful list of tips. I think that in so many cases, excess moisture = premature produce spoilage (at least that’s what I’ve personally experienced), so that’s why I always loosely wrap certain items in a flour sack kitchen towel that I can easily launder when it ends up looking iffy. One product that your readers might consider using to add an extra layer of anti-waste protection to their “produce storing repertoire” is something called FreshPaper. I found it several years ago at Bed Bath and Beyond *(not sure if they still carry it)* and I have heard that some Safeway locations keep it in their produce section. It’s kind of expensive — but maybe there are deals online. Basically, it’s biodegradable/compostable/recyclable paper sheets that are impregnated with an organic spice blend that naturally inhibits fungal and bacterial growth. FreshGlow is that company that manufactures FreshPaper and they claim that their product extends the life of produce 2-4 times longer. I’ve used FreshPaper in conjunction with many of the storage tips you mentioned above and I’m not exactly sure if FreshPaper makes a world of difference, but I can honestly say that I barely EVER waste veggies/fruits. Great tip! Thank you Elizabeth.